A couple of years ago, I was doing some backyard cleanup in my parent’s yard and I was starting to get a little frustrated. My problem was that I was trying to cut a large branch with ancient manual tools. It was at that point that I decided to splurge and buy my first chainsaw. It was nothing special – just a barebones corded electric model. Even that basic chain saw made my life a lot easier and convinced me that I never wanted to do that type of work again without a chainsaw. That first chainsaw didn’t last very long as it was only really designed to be used for pruning and trimming small branches. That first day in my parent’s backyard I really abused that chainsaw. It never quite recovered. 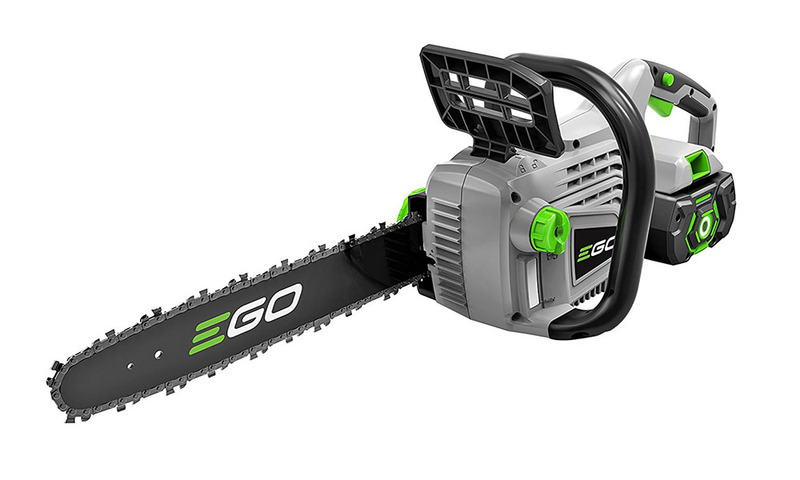 I decided it was time to upgrade, and one of the potential options I came across was the EGO Power Lithium-Ion Cordless Chainsaw. Not only is this a capable chainsaw, but it’s also battery-powered so it’s not damaging to the environment. The price tag is reasonable as well, coming in at well under $300. The first question that comes to mind when you think about a cordless battery powered chainsaw is “Does it have enough power?”. Battery-power is measured in volts and this model relies on a 56-volt battery, which is more than enough for most backyard jobs. You probably don’t want to try and cut down any large oak trees with it, but you can certainly trim the branches. It sure would have come in handy in my parent’s backyard a couple of years ago. As long as you have a spare battery ready in reserve, this battery will provide you with the power you need. A powerful battery’s one thing, but it’s not much use if your chainsaw can’t take it up a gear. The Ego Power Cordless Chainsaw takes advantage of that battery power nicely. The chainsaw revolves at 6300 revolutions per minute and that’s nothing to sneeze at. With the chain spinning that quickly it can easily cut through small to medium-sized branches in very little time. For that to be of use of course, your chain saw has to have a strong and durable chain and this one does. As long as you provide it with the proper maintenance you should get years of use out of it. Chainsaws come with varying bar lengths. Typically, a bar may be anywhere between 6 and 20 inches. Obviously, the longer the bar the more you can do with it. This chainsaw has a bar length of about 14 inches. It’s not the biggest on the market, but it is better than average. It will allow you to reach some of the higher branches in your yard. How high you can reach will also be dependent on your own height, of course, but adding an extra 14 inches to your reach can really come in handy. One thing you always want to be conscious about when using a chainsaw is the potential for kickback. To address this problem this Ego Power model comes equipped with a kickback brake for added protection. When working with any kind of power tools safety should always be your number one priority. It seems that the folks that manufactured this model agree. No matter how good the chainsaw is from time to time you’re bound to notice that the chain is a little loose. This model has a chain tensioning knob to adjust the chain when this happens. It’s an important feature that you should always look for when purchasing a chainsaw. It would be nice if we could always do our outdoor work in ideal conditions, but unfortunately that’s not always the case. Every once in a while, you may find yourself doing some yard work when the weather takes a turn for the worse. You might decide to take a break at that point, but some of the more hearty souls among us don’t let a little drizzle get in our way. If this describes you, you’ll be happy to know that the Ego Power Cordless Chainsaw is weather resistant. It’s probably not a good idea to leave it sitting out in the rain, but a bit of moisture won’t do into any harm. Any time you purchase power tools its important to check out the type of warranty protection that comes with them. This chainsaw comes with a five-year warranty on parts and a three-year warranty on the battery. That’s not bad at all and should make you a little more comfortable with your purchase. It’s probably not surprising that the biggest complaint most people have with this chainsaw is the length of time you can work on one charge. Some customers claim that they can use the chainsaw for no more than 10 or 15 minutes on one charge. It seems that these folks are in the minority, though, as most people that have purchased this model have been quite satisfied. If you’re in the market for a chainsaw and environmental concerns are important to you, the Ego Power Lithium-Ion Cordless Chainsaw is a viable option. The 56-volt lithium-ion powered battery gives you the juice you need for most backyard jobs, and at 6300 revolutions per minute it won’t take you long to get through any branch. The 14-inch chainsaw bar is also impressive. If you like the idea of a gas-powered chainsaw without having to worry about what you’re doing to the environment, then this is a good alternative.